It's funny, I feel like everyone I know who is in a weight loss journey is in a bit of a slump right now and having difficulty staying on track. Part of me feels relieved because at least it's not just me having a slump, but then of course at the same time that makes me feel bad, because I want everyone I care about to succeed! I wish I had some reason or sad sack story for being off track the last couple of weeks, but I honestly don't. I've just been in a funk. On the "more wholesome food" front, I made several smoothie packs this weekend, since I find morning smoothies are the best way for me to start out on a healthier note. We had a grip of bananas that were going rogue, so I made individual baggies with a banana and a cup of strawberries to stash in the freezer. That way I can just pull a bag out of the freezer in the morning and just make a smoothie for breakfast. It will be a nice change of pace anyway. Hopefully we can all get back to better habits this week and get those pants fitting better! Oh that's a great idea about the smoothie pack thing! No divvying out ingredients! Love this idea! Yea, I've been in a diet funk lately too but hopefully we will all be back on track soon. Love your smoothie packs...not just the idea but the color and organization...I just want to look at them :) I am excited that smoothie weather is coming...bring on the blueberries! 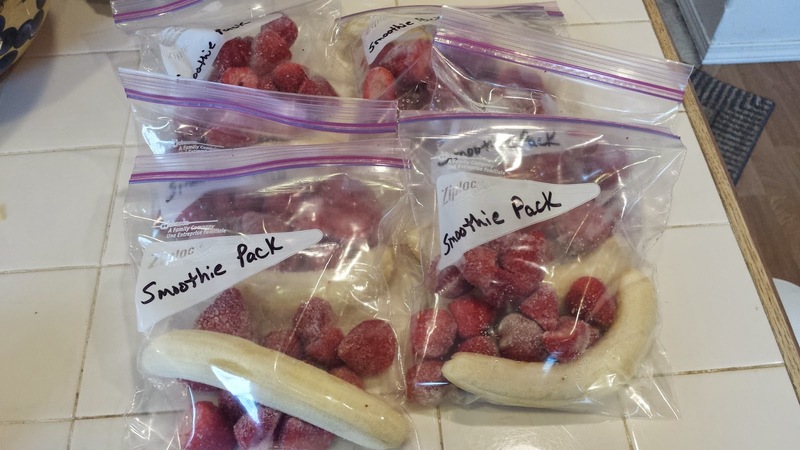 I love the idea of prepping smoothie baggies ahead of time! I have a ton of bananas and frozen fruit in my freezer. I'd be more likely to use them in smoothies if we had them divvied up ahead of time.